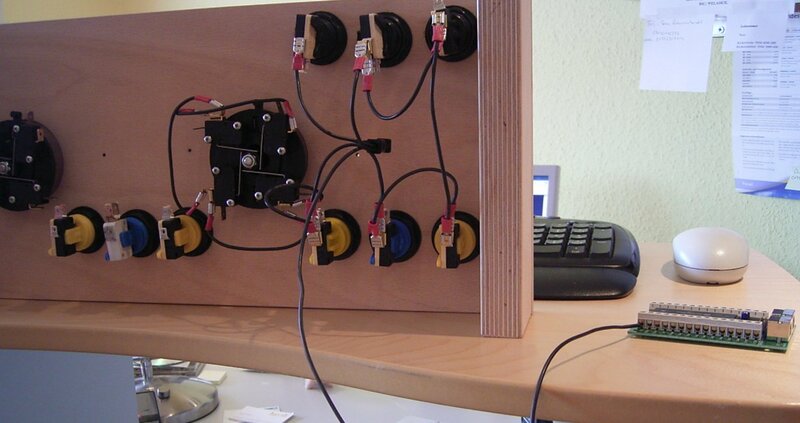 While planing my arcade cabinet, i build a control panel for testing. 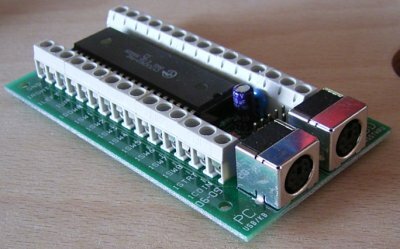 I use a I-Pac² made by Ultimarc.com to connnect joysticks, buttons and keyboard to the computer. The keyboard interface manages 28 functions directly and the same number with a user defined shift key. The keyboard can be connected to a pass-through PS2 connector. The I-Pac² is connected with the computer via an USB-cable. The free commandline program Ipacutil can be used to configure the keyboard interface. I'll try that later, for now i only need the preconfigured functions. This is the skeleton of my control panel for testing. 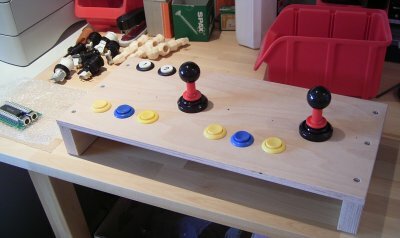 I install one joystick and three pushbuttons for each player, and one button for player start 1 and 2 and coin 1. That's enough for testing, everything else can be done with the connected keyboard. In this picture the pushbuttons sit in their holes. The first buttons i bought were the cheapest crap available in china. I disposed them right after my first tests. The second set i bought were made in europe and of much better quality, but i didn't like the loud clicking sound they made. In the end i decided to use leaswitches for all buttons. Only the three buttons next to the trackball use microswitches, because there was not enough space for the big leafswitches. This picture shows the wiring for the first player. Only the ground is connected right now. I made a series connection including all buttons and joystick switches. that saves a lot of wiring, but the downside is that one loose contact disables the whole thing. The first finished control panel is the one using a keyboard and trackball.